Extra-long, symmetrical cord. I measured it at a hair under 50 inches from the top of the earbud to the audio jack. As a really tall dude, I appreciate being able to stick my music player in my pants pocket without stooping to accommodate a short cord. Right-angle 1/8"/3.5mm audio jack. This is personal preference, but I always find straight jacks catch on clothing. Foam earbud covers. These fit over the speaker side of each earbud and provide a little cushioning and a better grip than the smooth plastic shell. They were a tight fit and a little hard to get on, so I don't think they'll be coming off. Minor concern: the cord is pretty thin so durability may be an issue. For a product costing about $15, I can live with that. The earbuds themselves are a bit larger than original Apple earbuds. They fit my ears well snugly but might be a little big for some people. I measured one of mine with the foam pad on and it is approximately 11/16"/17.5mm. Note that these headphones do not have a mic or integrated volume control. They are just earbuds. Bottom line: Thumbs up. I'm pleased with this purchase and, barring sudden failures, would buy Sennheiser's MX 365 earphones again. I chose the white option (easy to spot in a bag), but there are other color options available (the manufacturer's page says six colors, but I've only seen blue, red, and white). These earphones have a 2-year manufacturer's warranty. Full disclosure: This post uses Amazon affiliate links. Well, I've finally gotten around to providing a year-end wrapup of PBE Games releases. I think this listing covers everything released since the last post I did in December. I'll start things off with Hexed Places - Dead Rock Spires, which takes its name from the natural pillars and buttes that rise above its barren wastes. Ancient stone piles atop many of these prominences mark the neolithic barrows of an unknown race. Sour Creek, the only water source in this rocky desert, carries a poisonous stew of chemicals that coats the rocks along its banks with black and orange crystalline deposits. Hexed Places include GM and player maps for a 6-mile campaign hex along with descriptions of interesting locales and encounters, extra odds and ends, and a random encounter table. 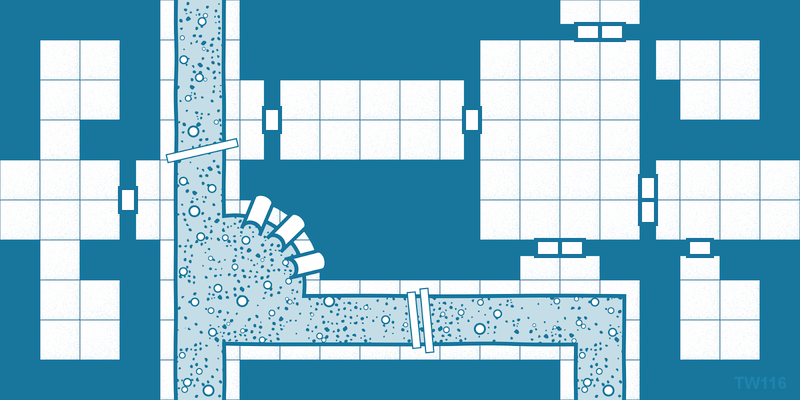 The simple stat blocks provided are easy to adapt to most OSR games. 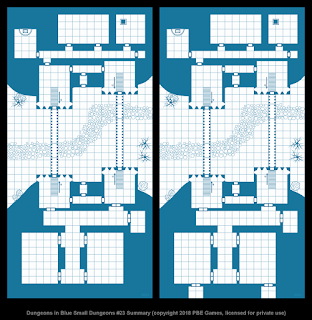 Next up are three triple packs of Dungeons in Blue geomorphs. 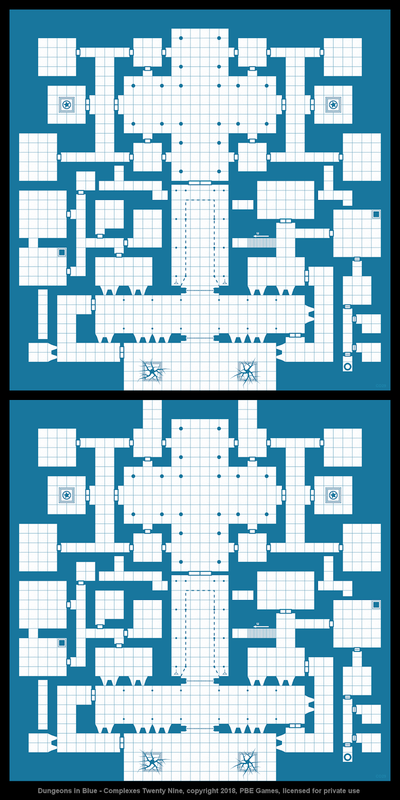 Miscellany #1, Miscellany #2, and Miscellany #3 each contain 16 quarter-size tiles, each featuring dead ends, edges, corridor style transitions, or elevation changes. They simplify connections between disparate geomorph types. All three sets are available as part of a discount bundle. 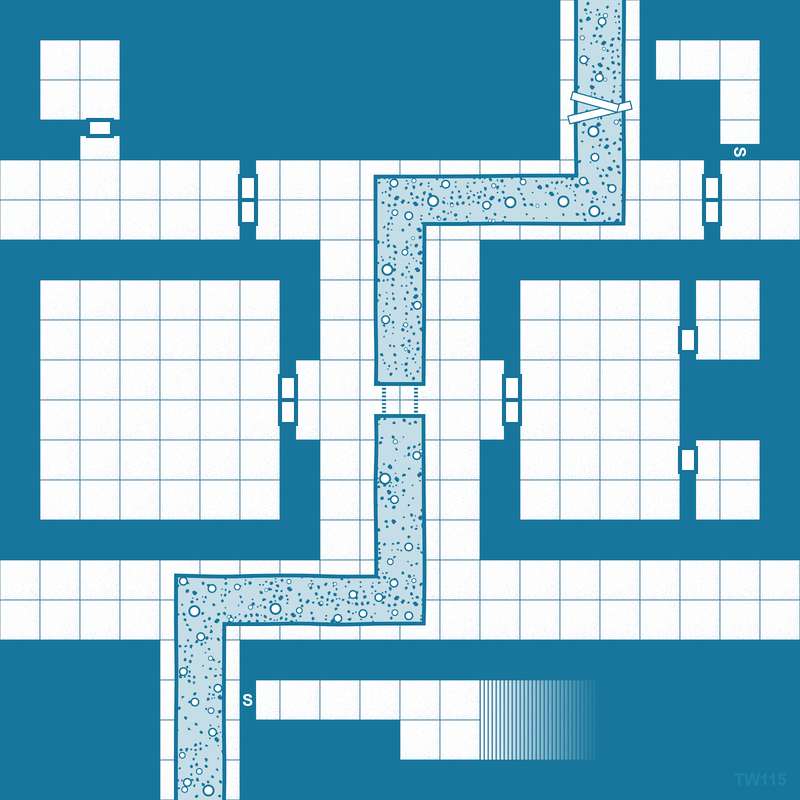 Small Dungeons #28 shows a cave complex that hides a small lake. 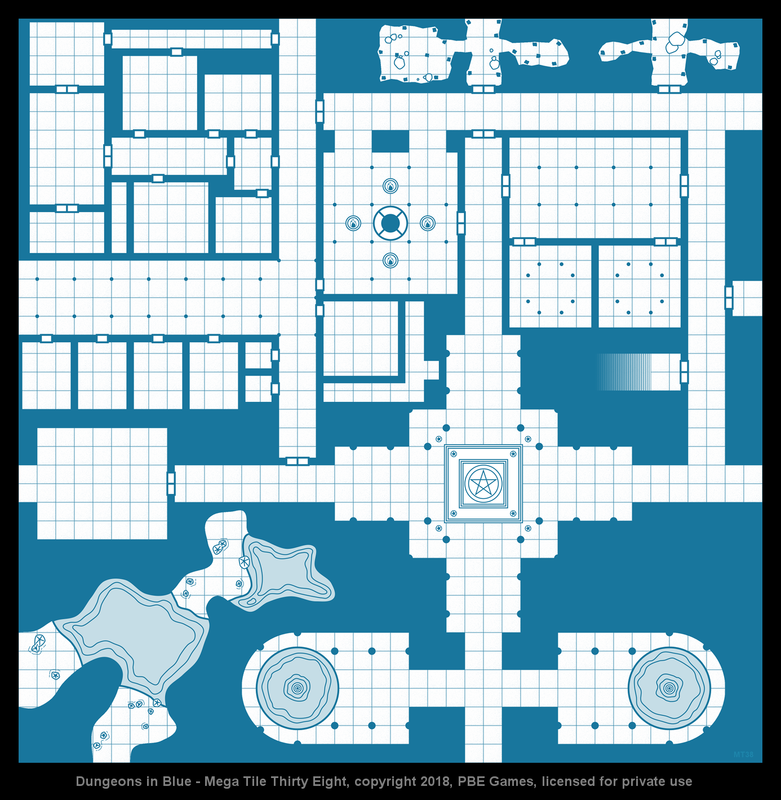 Cages and statues hint at this locale's dark purpose. Small Dungeons #29 is a small mine with twisting passages and a few small, rough-hewn chambers. 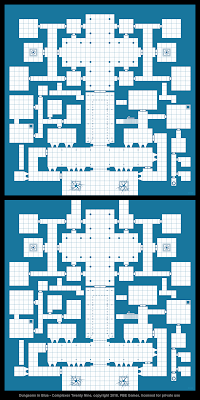 Small Dungeons #30 shows a traditional dungeon complex divided in two by a deep chasm. Complexes #28 depicts a tunnel or chasm that passed between two sheer cliffs. 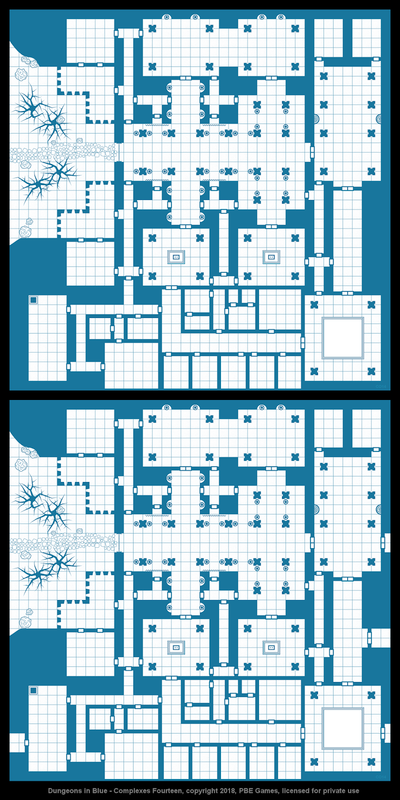 Rooms and chambers are cut into each cliff face. 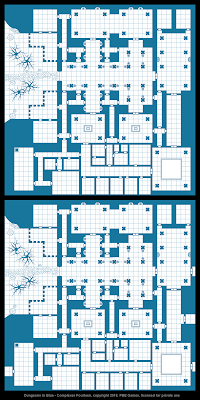 Complexes #29 is a traditional dungeon with a large central hall, outer fortifications, and many side rooms. Complexes #30 shows a large cavern with several water features. Smaller tombs are carved into the cave's walls. 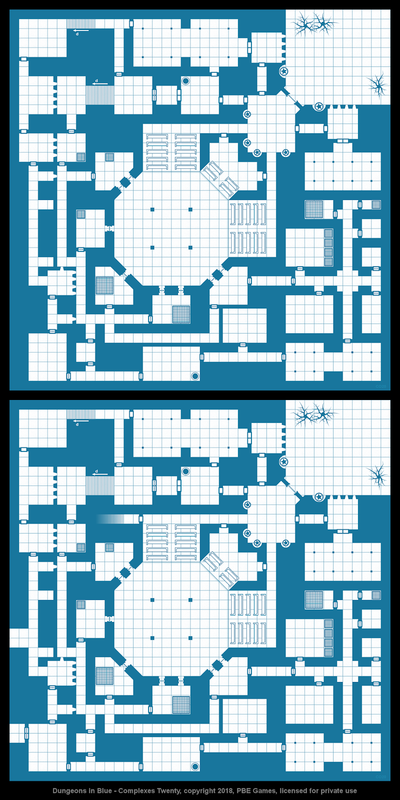 Small Dungeons Map Pack #10 and Complexes Triple Pack #10 offer the usual discount on the items above. 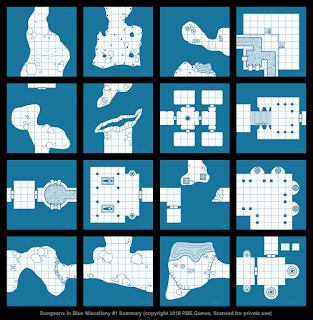 Finally, Small Dungeons Complete pulls all 30 Small Dungeons maps into a single discount bundle. So there you have it, the end of 2018 wrapped up with a nice bow on top. Except, you know, no wrapping paper. Or bow. Thanks as always for reading. I hope you find something useful here. Happy gaming. As we wind our way to the end of the year, here's a quick update on new PBE Games releases. The first item on the list is Animal Companions, an OSR-friendly system for leveling mundane creatures such as dogs, mules, or horses. 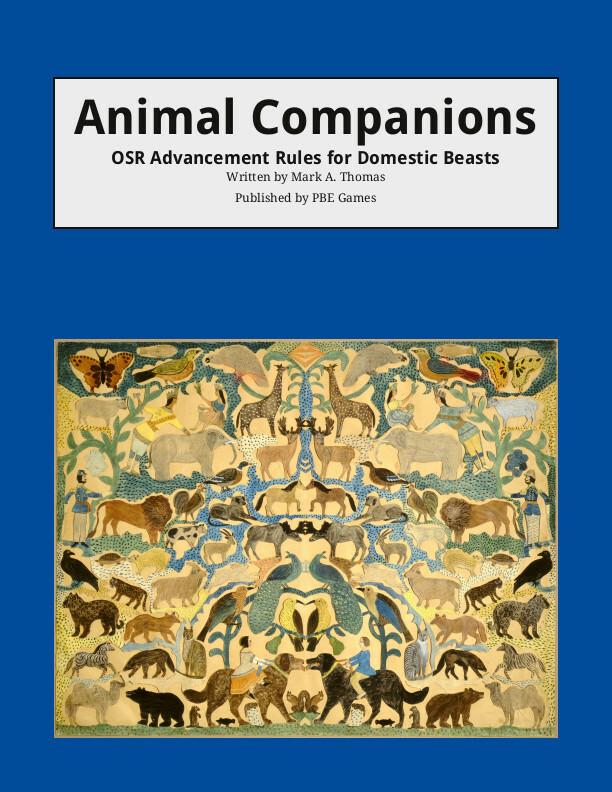 In addition to outlining rules for companion training and care, Animal Companions includes the Beastmaster, a character class that can tame powerful animal allies. You can check out an early/rough version of the material in Animal Companions right here. Complexes Triple Pack #8 contains Complexes #22-24. Complexes Triple Pack #9 contains Complexes #25-27. 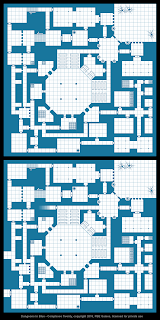 Small Dungeons Map Pack #9 contains Small Dungeons #25-27. As usual, bundle deals offer access to multiple products at a discount. 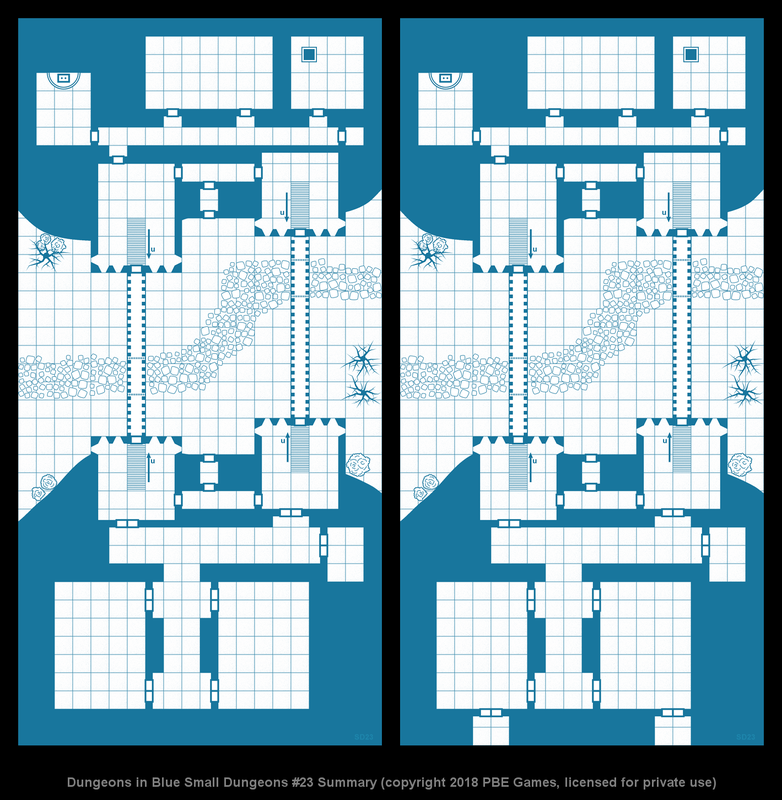 Looking ahead, I have three Complexes, three Small Dungeons, and three sets of assorted Dungeons in Blue geomorphs in the queue for 2018. 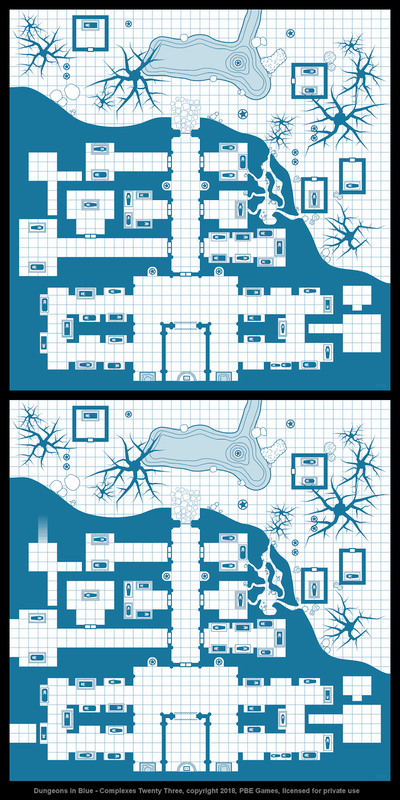 There's also one more Hexed Places waiting in the wings. 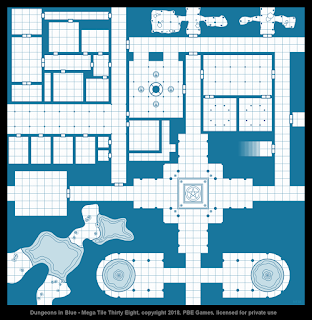 Early in the new year, I'll update the Dungeons in Blue Master List to include all products released this year. Here's a special offer for those willing to read this far: Pick up Animal Companions for a buck off using this link. This offer is good now through Christmas 2018. Thanks, as always, for reading this update. I hope the holidays treat you well. With G+ on the way out, I've been looking at alternative channels for communication. My findings thus far are... disappointing. I joined MeWe to see what it offered and discovered it's more closely attuned to Facebook than G+. The lack of circles and group organization tools, plus the friend-approval process make it a much less useful platform for passively following people you're interested in. I've thought about digging into some of the RPG-focused Discord servers, but I'm less interested in chat than I am in thoughtful posts. I guess I need to update my RSS feeds. This blog is still a good place to keep up with my gaming thoughts (woefully lacking lately) and PBE Games releases. I try to post an update on new products every month or so. I'm on MeWe and I'll be posting new PBE Games releases there as they happen. I'll also be posting updates on my YouTube channel (more on that below). You can find me on Twitter, which I also use to announce product releases. I sometimes post random humor and IT security news from time to time, and I'll be posting YouTube updates here too. I'm still on G+ and will be until the end. You can also use the PBE Games contact form to hit me up via email. 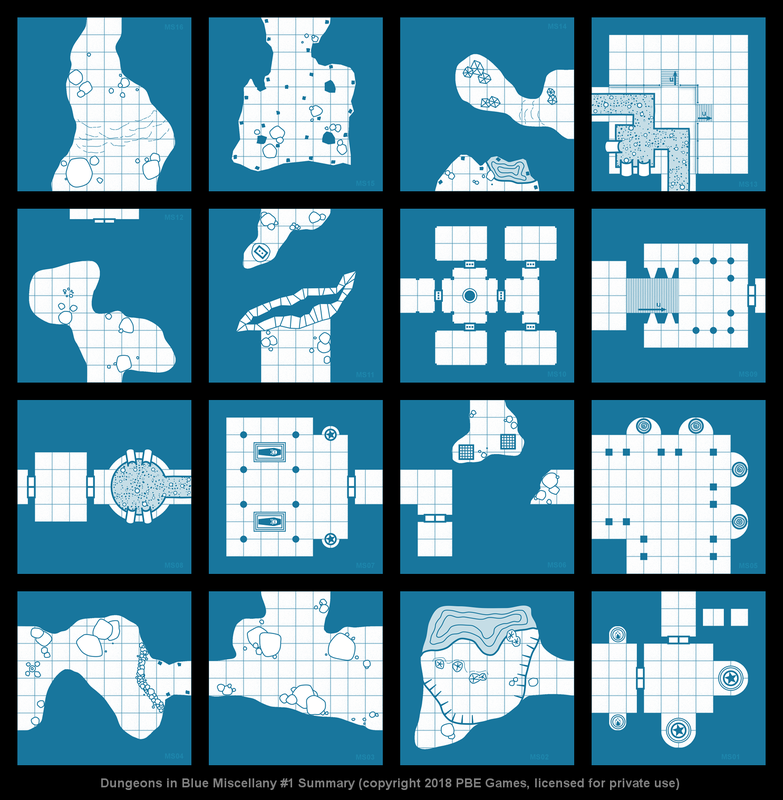 PBE Games on DriveThruRPG is right here. Finally, I've just started a YouTube channel that's going to feature me playing a variety of video games. I soft-launched this a week or so back, and I'm still working out some of the tech details, but, if you're interested in video games, I hope you'll take a peek. The first series I'm doing is a let's play of Minecraft Stoneblock, but I'm starting a let's play Path of Exile series when the Betrayal league launches. So, I think that covers the bases. I'll keep this post pinned to my G+ profile and update it when/if things change.